Styled and Framed| Covering Fashion & Lifestyle by Miguel: Are Designer Jeans an Investment or a Status? It is no secret that today you’ll see many more companies investing all their money in solely producing great quality jeans that will attract a customer’s attention; collaborations seems to rocket their credibility. There used to be a time where Levi’s (the ones with the diminutive red and camel square tag behind) were the must have pair of jeans for any obsessed fashion fanatic. They still are one of the most coveted, but not the must go to for everything now. 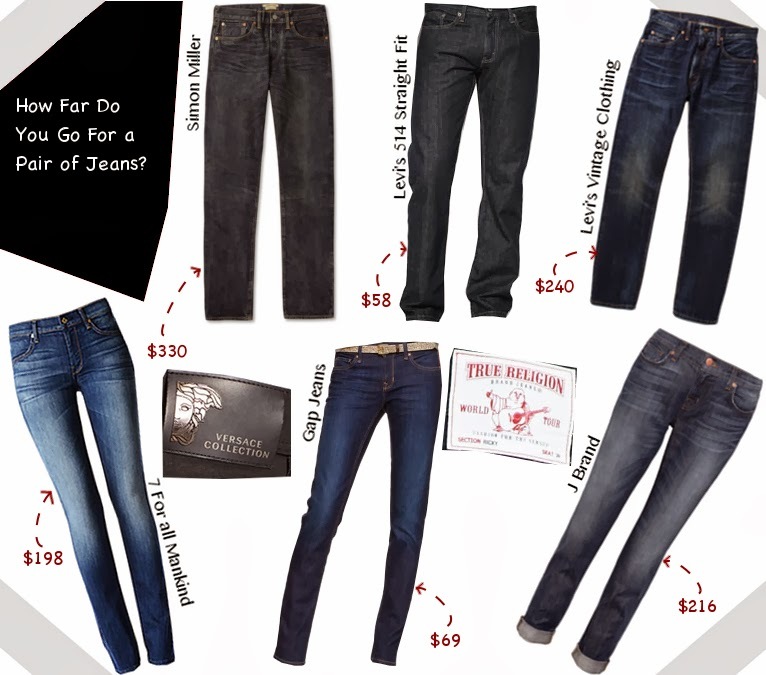 In fact, jeans have become a piece of symbol – with other competitive labels convincing us they have the perfect fit and quality– prices for these items can range from $160 to $500+ for a single pair of jeans that would sound ridiculous. But there are fashion magazines and adequate marketing techniques that have introduced us to so many new and overwhelming denim labels – 7 for all Mankind, A.P.C., True Religion, Paige, J. Brand, Simon Miller – and many other designer labels that include denim in their collections, it is fair to state jeans have become not only a form of wide branding, but quality status for many. So what happens when you invest in something greater than the average (more than $100 perhaps)? And what’s the difference between a nicely washed straight jeans from Macy’s to an exclusive Armani Jeans or a pair of Prada? Or even Levi’s more original Vintage Clothing label that raises the prices from its other diffusion line? They say what you pay for is what you get for, which is the result of these items. There is no doubt highly priced jeans are constructed better to fit your silhouette. Made with higher quality fabrics that will last longer and get better over the time. And paid well attention to details – deconstruction, bleaching techniques, stitching, and more. And the more details is put in, the price tag will just slap you in the face like with a $2,390 Saint Laurent gold-chain skinny jeans you could maybe DIY for a cheaper version (shhh!). But I believe the major player here is the stimulus of society. The feeling of having the True Religion label tag hanging around seems to make some internally appear cooler and important; look at me, you know I paid more than $200 for these. At least these happens here all the time in the South. One seems to also feel better to pay an extra $100+ for a Vintage Clothing Levi’s jean than its counterpart. You try on a pair of Gucci or Givenchy and you feel the best because you know its luxury, but I think we tend to forget if these pair even looks great on you for such an elevated price you’re about to cash out. Investing on pants is one thing, but jeans are something else. Is there any difference these items will do to you that other people will want to know where you got them from? There are even bespoke denim shops – 3x1, Jean Shop, and Levi’s – that offer you the chance to customize the perfect pair of jeans that have the possibility to fit like a glove for a beginning price of $500 to $1,000 or more if you keep adding on needs. Take it as a special item made just for you and no one else to share with – not even yourself if you gain some weight. In general, I’ve learned that it is important to invest in a pair of great quality jeans, but you also have to know which label fits your needs. It’s not about the higher the price the better your rear. For a guy with thicker thighs, True Religion may be the “it” of the South, but for the fit of my needs I pass. Why waste $269 when you won’t feel comfortable, but ok, socially in? As you learn more, you realize sometimes things look marketable on a skinny guy or girl than on an actual real human. I may confess to find some straight Dolce & Gabbana jeans favorable for a tag label, or some splendid and badass Balmain biker jeans the real investment, but personally I’d agree sometimes there is nothing better than slipping on a good old pair of Levi’s that come in so many choice of styles. Still, one or two of another wouldn't hurt if you know how to choose wisely. Fashion and society can sometimes can be confusing.